Bathrooms tend to get forgotten about when it comes to home decor particularly in a minimalist home. With minimal interior styling they become solely functional rooms with a sterile appearance. Houseplants bring energy and life to a room and the luscious green foliage can completely transform the appearance of your home. 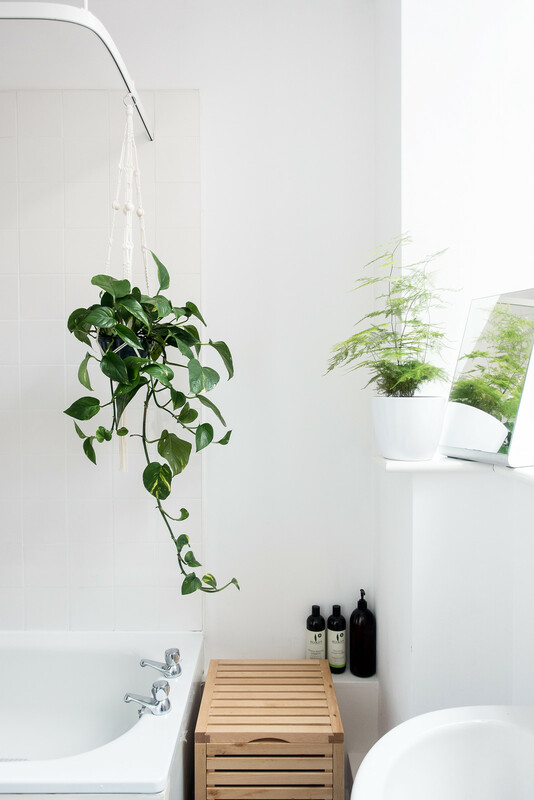 Bathrooms typically have low-light and high humidity creating the perfect environment for certain types of plants, and there are some advantages to be had from keeping plants in your shower. They improve the air quality, absorb excess moisture, eliminate bacteria, and create a peaceful environment to relax in. Most bathrooms don’t have much of a windowsill to display plants on; you might balance pots on the side of the bath, on top of the medicine cabinet, or even on the back of the toilet, the best way of displaying houseplants in the bathroom is by making use of all that vertical space. If you choose a trailing plant its waterfall of leaves will create a botanical feature in your bathroom. Macramé hangers look super pretty and complicated but are surprisingly easy to make especially if you start with a DIY kit. The Wool & The Gang “Top of the Pops” Kit sets you up with simple instructions to make two hangers. If you don't want to make one yourself, you can always buy a macramé hanger; and if you don’t want to drill hooks into the ceiling, tie the hanger to the shower rail or hook it over the back of the door. Bathrooms are well-suited for tropical plants but be mindful of two things before buying any houseplants specifically for your bathroom. If there is very little natural light choose plants such as spider plants, philodendrons, orchids, snake plants, bamboo, or aloe vera. If you have big windows and lots of light, ferns, air plants, ivy, and peace lilies will happily thrive. 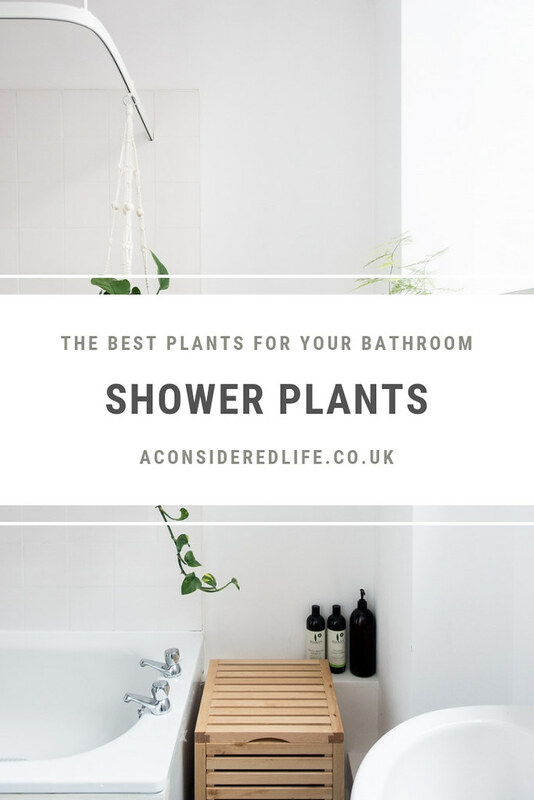 Below are some of the more interesting “shower plants" you can keep in your bathroom. Devil’s Ivy has heart-shaped leaves with variegated leaves that give them a marbled effect. It’s a fast-growing trailing plant that grows long tendrils meaning you have several options for displaying it. You could hang it up in a planter and let the leaves hang or you could train it to creep across the walls or window around the doorframe or shower. It’s a hardy plant that enjoys humidity, thrives in moderate light, and is happy to be watered infrequently. 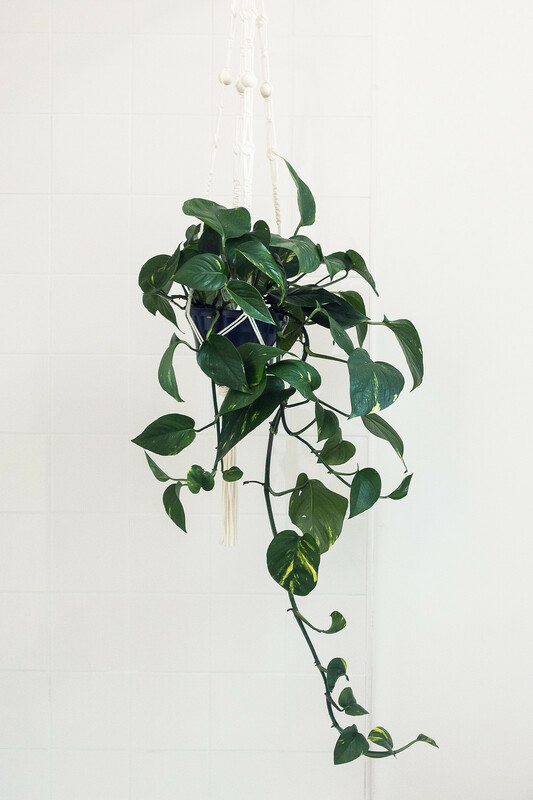 Devil’s Ivy is a great choice for making use of all that vertical space and for creating a tropical paradise in your bathroom. The Blue Star Fern is one of the easiest ferns to care for; enjoying low light conditions and moist soil, it’s very hard to overwater this plant. It grows dusky green-blue leaves that grows as tall as it does wide (typically no more than a foot). It looks fantastic when clustered together with other plants, which also helps increase humidity. The colour and shape make the Blue Star Fern an interesting addition to a bathroom but doesn’t require any special treatment to keep it happy. 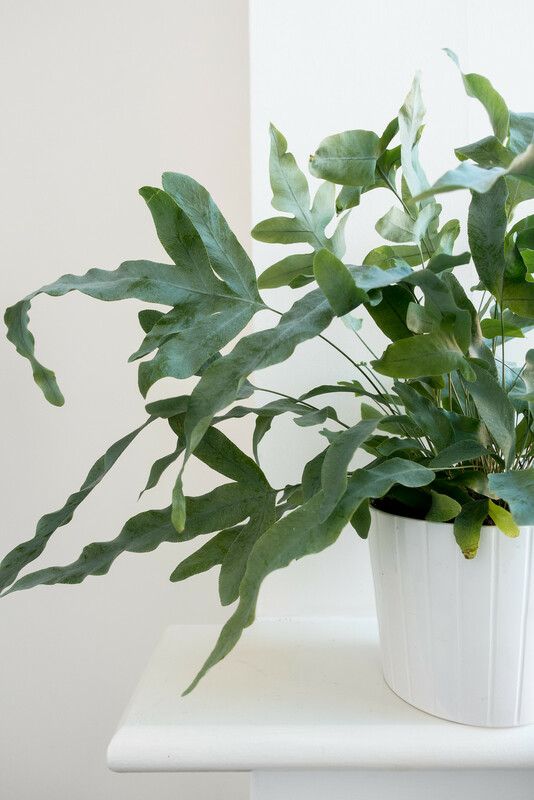 Keep your Blue Star Fern at normal room temperate with higher humidity (misting will keep it extra happy) and frequent waterings from the shower should be enough to see it flourish. These plants tend to be a big hit or a big miss with some people but they’re such easy-going plants and great for aspiring indoor gardeners. Begonias are popular houseplants due to their attractive foliage; their leaves can have a variety of bold colours and striking patterns. They tend to grow quickly, pushing out plenty of leaves, creating a beautiful display that looks stunning in a bathroom environment. These plants enjoy bright indirect sunlight, high humidity, and frequent waterings. Begonias are quick to let you know when they need more water, which makes them the ideal plant for beginners. The Zanzibar Gem (or ZZ Plant) is virtually indestructible. They’re tough plants that require very little care or attentions to grow big and healthy. The fleshy oval leaves create a feathered appearance and it has a waxy coating, which can make the plant appear artificial. The ZZ Plant will grow in extremely low levels of light, which make them ideal for window-less bathrooms. Water only when the soil has dried out otherwise leave it alone; the more you leave this plant alone the better it will seem to grow. Asparagus ferns are not true ferns yet have similar requirements and leaves that resemble them. A little more fussy than the Blue Star Fern but relatively straight-forward to care for. They have stunning horizontal spreading frond-like branches resembling the rainforest canopy. These delicate looking plants are happiest with bright indirect sunlight, regular waterings, and high humidity. They are quite happy to live in your bathroom where they receive misting from the shower from a bright spot near the window.